Does your paper airplane have flying problems? There are some ways to solve the problem. Here, I'm going to write about the vertical deviation. Problem: The airplane turns upwards. 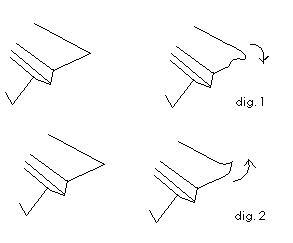 To fix this, bend both wings towards down, as indicated in dig. 1. Problem: The airplane turns downwards. To fix this, bend both wings towards up, as indicated in dig. 2. I have also figured out that folding both wings towards up so that the airplane has a "Y" shape works quite well. In the next part of this mini article, I'm going to write about horizontal deviation.